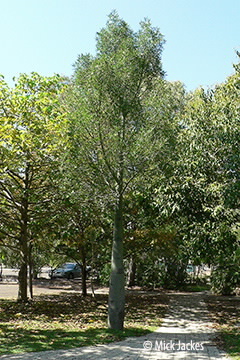 This tree has a greenish trunk with furrowed bark, a swelling or bottle develops with time, leaves simple on mature trees, digitately and deeply divided into 3-7 narrow lobes on young trees. Flowers bell-shaped, creamy-white with red stripes or splashes. Fruit is a follicle, boat-shaped to 3 cm long.